Greg Mercer (GM): What’s up guys? We are live for AMA Wednesday. This one’s part of our Genius Series, which hopefully all you guys know about by now, but if not, the Genius Series is something we’re doing throughout 2018 where each month we focus on a different topic that you guys told us you wanted to learn more about. This month we’re focusing on product sourcing. This is a live AMA so drop your questions in the chat box, wherever you’re tuning in from, I’m more than happy to answer them for you. I’ll be here for about the next 45 minutes. While we wait for some of the questions to pile in to the chat box I have a few quick slides for you guys, then we will jump right over to the slides that … Excuse me, then we’ll jump right over to the questions that you guys are putting in the chat box. The Genius Series, this is a crash course in becoming a private label seller. We are putting this into bite size chunks so anyone can learn how to sell private label products on Amazon. Like I said, each month we’re focusing on a different topic. This month we are focusing on the product research phase, and the questions that I’m going to focus on answering today are about product research so try to put that type of question into the chat box. … what we’re looking for when we are sourcing products to sell on Amazon, okay? Back in the day, before Jungle Scout, before there was tools out there to help you, you had to kind of guess what you think might sell well on Amazon. It’s much more scientific than that now, okay? We’re looking for products that have existing high demand on Amazon, all right? Now that we have Jungle Scout and tools like Jungle Scout exist we can figure out exactly how much these products are selling on Amazon. Gone are the days where we’re trying to guess what might be selling well, we can just sell the products that we know will sell well because they have high demand on Amazon, okay? We’re looking for products with low competition, so of course there’s tons and tons of products that have tons of demand on Amazon, but we’re looking for those ones that have high demand with low competition, and yes, there are plenty of those out there, and I’ll go over how to help you find those. We of course want good margins. I prefer products priced over $18. Ideally your product has low seasonality, okay? If you’re selling inflatable Easter bunnies, these are only going to sell for like two months in the Spring time, kind of leading up to Easter, right? Same thing with Christmas lights or other items like that. It’s hard to build a business selling items like that. We like items with low seasonality. Of course we want something with no legal issues, all right? Lightweight and small is preferred because it’s easier to ship from China or wherever you’re sourcing these products from. The one in the bottom right there that I’m kind of blocking with my video says you can improve the product, okay? This one I think’s becoming more and more important as there’s more and more sellers on Amazon. What I mean by that is we’ll take this glass for example. Finding products where we’re reading the bad reviews, they’re not getting very good reviews, and we’re finding items that can improve. Maybe if I were to read this, some thing’s might be as simple as saying, “Hey, this glass arrived at my house broken.” So I’m leaving a one star review. What I mean by improvements, you can actually just do something as simple as improving the packaging for that particular product and then your item will get better reviews than some of your competitors, all right? These are some of the questions that you guys had put in the comments on the blog before. So we’re going to go over these real quick while we’re waiting for more questions to put into the chat box, even though I know there’s already a bunch of them. Is private label still the best way to make money on Amazon? My answer to that is yes, okay? When we think about it, Amazon is, I think tons and tons of people agree that this is like still the best opportunity for entrepreneurs to get started with a business, okay? Amazon is alive and well, it’s working very well still, and if you think about all the different ways to kind of source products to sell on Amazon, you know, there’s like the whole arbitrage thing where we could be buying products from a liquidation store, or Walmart, or Target, whatever else. That’s not a very scalable solution, right? It’s still kind of like a job where you have to go out and spend time finding these products, and then you run out of supply or whatever. I could purchase them from wholesalers like Sony, and like Black and Decker, and like whatever else. The problem with that is you’re selling on the same listings as everyone else, you’re competing for that buyer box, and it’s unlikely that you as a small time Amazon seller is going to get good enough pricing to really compete with those people. Then that leaves us with our last option what’s commonly referred to as private label option, and that’s getting the products straight from the factory. I’m not talking about inventing a new product and then going out and finding a factory to create this product for you, but instead you find products that are already being manufactured. Again, this glass would be a great example, right? Some factory in China is already making this glass. I’m just going to purchase it from this factory and private label it. So I’m going to put my brand on it and then I’m going to sell it on Amazon. A huge benefit of that is then you have your own listing on Amazon, okay? The answer to that, yes. Private label’s still the best way to make money on Amazon. Is selling on Amazon as easy as when you got started or has it gotten a lot harder? All right? This kind of goes into option two, okay? Sorry, the question number three. Question two and three, we’ll kind of roll those in together, like is finding products still the same? My answer to this is when I first got started there were many less sellers on Amazon, okay? It was less competitive, but also back then there was pretty much no information about how to sell on Amazon, so I had to kind of like learn all this stuff the hard way, all right? There was also nothing like Jungle Scout to be able to verify product demand, so that made it much harder. I don’t know if it’s necessarily gotten harder, even though it’s gotten more competitive, because like Jungle Scout exists now and it’s much more advanced, it’s much more easy to find these products using the technology. The education, like the Genius Series didn’t used to exist, so this makes it so much easier now for new people to learn this, learn how to do this. Maybe I’d say overall, all things considered, maybe it’s gotten like 10% more difficult, 20% more difficult, I don’t know. It’s still a tremendous opportunity at the end of the day, all right? I just want to talk about this real quick, all right? What I prefer and what you’re going to hear me kind of preach about and everything for, is this left method here, The Logic Method, all right? When we’re talking about The Logic Method versus kind of like The Passion Method, I’m a huge believer in using the data to show us what’s going to work well for us on Amazon, okay? I much prefer kind of like The Logic Method as far as using the data, using the demand data, and the competition data, and opportunity scores, and everything else to reduce the risk of failure and increase the chance of really succeeding on Amazon, okay? That’s what I really prefer. A lot of people talk about kind of wanting to sell the items that they’re passionate about, and this does have some benefits. Maybe this makes you just care about your business more, makes it more fun for you. All those things are important at the end of the day as well, but the thing about that is a lot of times I’ll see people sell items that don’t have much demand, or are super competitive and they just want to sell it because they’re passionate about it, so it’s something you have to be really careful of, all right? I’m just going to go over this real quick because I want to jump into the questions because I know there’s tons of them. How big of a deal is it to innovate … And then again, these are questions that we’ve gotten on our blog. How big of a deal is it to innovate and improve your products? I would say that this is becoming more and more important, and I’m a big fan of it. I would encourage everyone watching this to try to innovate or improve the products. That’s as simple as finding products that are selling well, even though they get poor reviews. Reading those poor reviews and finding what the customer wants changed in that particular product, okay? I’d say that’s a big deal. Which category should I stick with when starting out? The only thing that I recommend to people when they’re first starting out is I would recommend selling in a category that you don’t have to get un-gated for, okay? What I mean by that is when you sign up for a brand new account on Amazon some categories you have to get Amazon’s approval to let you sell in that particular category, okay? It’s usually not that difficult, although sometimes people do run into problems when doing that, however, that’s just like one extra hurdle. When you’re starting out a new business, so much of it’s mental that you really want the least amount of hurdles as possible getting started. I would recommend selling in the categories that don’t require getting un-gated, all right? Does it make more sense to pick products that have the good numbers or products that you’re more passionate about? Again, I just kind of talked about this, but I’m a big fan of going off the data and the metrics as opposed to kind of just what you’re passionate about. It’s important to understand the costs when you’re calculating the margins, and we have a lot more written about this on the blog. We’ve listed out a few of them here just to hopefully kind of jog your memory of all the different things that you might run into when you’re kind of calculating the costs. These are questions that we get a lot, how much does it really cost to launch a product on Amazon? We wrote a great blog post about this about a year ago, but I would say if you don’t have $2,000 to invest in the business, I probably wouldn’t launch a private label product on Amazon. I would probably start off with retail, arbitrage to make some money or something else. There’s lots and lots of success stories of people who only had like 500 bucks, but the way I prefer to do it and the way I like to kind of like go about it with a larger launch and stuff, you really need a couple of thousand dollars to get started. Another thing that we’re seeing more and more often is what do you think about Kickstarter? Kickstarter’s great, I think that’s a great way, you know, especially if you’re finding your product, you’re making improvements to it, and it’s like this new enhanced version of your product, then I think Kickstarter’s a great way to raise funds for your product and help kind of prove that demand as well. So, drop your question, I’m going to start. I know they’re already here. Put your questions in the chat box, I am going to start answering some of these questions because that’s the whole point of doing this AMA, I want to help answer any questions you guys have and remove any of those hurdles, because I know as an entrepreneur a lot of the times it’s just like one little question that’s kind of holding [inaudible 00:14:49]. Sorry, wasn’t supposed to play that video. All right, two quick announcements before I answer these questions. There are a lot of open positions at Jungle Scout, we are growing very quickly and we need more help. Junglescout.com/jobs. There is openings available in marketing, in design, engineering, and customer support. Go there if you’re interested in working for Jungle Scout. We have office in Vancouver, Canada, in Austin in Texas in the US, as well as most of our jobs are able to work remotely. If you’re interested in working with the coolest company in the world, junglescout.com/jobs. One other quick announcement, we’re starting a new podcast soon called Go Pitch Win. Shark tank style podcast where you can pitch your product to myself and one other guest judge. At the end of each season one out of 10 people will be selected for a $10,000 prize to help them launch their product or business. Find out about it at junglescout.com/podcast. Enter to pitch your idea to me. All right, jumping into the questions. This one’s on YouTube. The opportunity score is a way that we are calculating what we estimate the opportunity to be, okay? It’s on a scale of one through ten in the extension, ten’s the best but that’s extremely rare. Obviously it’s a linear scale from there. This isn’t the end all be all score, but this is a great way to help you gauge whether or not this is a good opportunity for you. Opportunity scores of six, seven, eight, those are typically good opportunities or at least opportunities that you want to pursue further. What the opportunity score is calculating is what’s the ratio of demand versus competition, and it factors in a few other little things as well. That’s going to be the main thing. What it doesn’t know is if the margins are good for this product, because it doesn’t know what your sourcing price for that product is, okay? All right, another one on YouTube. I’d be happy to. BSR stands for bestsellers rank, almost all products on Amazon have a bestsellers rank. Most of them have a bestsellers rank in their parent category. This means if you have like a BSR, bestsellers rank of … This mouse here has probably a BSR or like 1000 in computers and accessories, all right? This is the 1000th bestseller in that particular category, all right? Now, before tools like Jungle Scout there was all kinds of rules of thumb like, oh, you should try to sell products to like 1000 BSR or less, or blah, blah, blah, blah, blah. The truth of the matter is, BSR in itself is not very helpful, especially when you’re just starting out because it varies so much from category to category. A BSR of 1000 in sports and outdoors sells extremely well, like 10,000 units a month probably, because that’s a very big category with a lot of volume. A BSR of 1000 in like appliances, probably only sells like 50 a month. To answer your question, how should it impact my decision about what product to choose. The only way it should impact your decision in my opinion is to use the BSR to figure out how well that product sells. You can go to like junglescout.com/estimator, it’s a totally free tool, you can put in the bestsellers rank in there, and then we’ll tell you approximately how many units that item’s selling every month, all right? All right, another one from YouTube. Okay, our estimated sales to the Canadian market is high quality, it’s pretty darn accurate. The Canadian marketplace on Amazon is much smaller than the US market, okay? You have to keep that in mind, I think that’s the reason that you’re probably looking at products in the Canadian market, comparing it to the US market, and you see they’re much lower. Hopefully that helps. I think mentioning another supplier’s price is a solid negotiating tactic. Personally I don’t think I would mention the other supplier’s name, but if you feel like that’s appropriate you could. Yeah, hopefully that answers your question. You could say like, “Hey, I like working with you better, you seem to respond to my questions better and it’s really easy to communicate with you and everything else, but they’re giving me … It’s 50 cents cheaper so I kind of have to go with them.” That’s something you could say and use that as a negotiating tactic. Thank you, Linda, I appreciate the kind words. Amazon is very frustrating to deal with. It sounds like you’ve figured this out by now, because you ask them questions and it’s very clear that they’re just sending you this generic saved reply, right? To directly answer your question, unfortunately it’s pretty much impossible to get Amazon to respond with more details. I think a lot of them aren’t allowed to give you more details. They’re also probably graded on kind of how many tickets they’re responding to every hour, so they don’t want to sit there and write you out this long drawn out response. Unfortunately it can be extremely frustrating, but they probably will not give you more details when you’re not approved to sell in that subcategory. Sure. Something to keep in mind when you’re launching a product is you need sales velocity. You need sales on Amazon. Before you get sales through that listing, your listing’s just lost on the last page of Amazon, okay? Once it starts to get sales, that’s when you start moving up the rankings. So, you’re kind of left with the chicken and egg problem, right? Without sales you’re not ranking well, without ranking well you’re not getting sales, so what do you do? Well there’s, in my opinion, the two best ways to launch a product are through aggressive PPC spend on Amazon’s platform, and through giving away coupons, okay? Jungle Scout has a tool called Jump Send, you can find it at jumpsend.com and it is a marketplace for you to give out coupons for people who are interested in purchasing your product. What you can do is you can create some coupons, you can put them on Jump Send, and on Jump Send there’s tens of thousands of bargain hunters that are there looking for coupons, okay? This is a great way to give away coupons, for people to receive your coupons, use that coupon to purchase through Amazon, and then as a result your product will begin to rank better over time, all right? Those are some recommendations I have for launching. Yes. All right, so for example, if this … We’ll use our hooded baby towels as an example, we have different colors, right? We have blue, we have pink, we have white, and we have gray now, all right? Some examples of different keywords that I use for different variations are I definitely call out the color, all right? Because some people will search, and I see this on my PPC reports, some people will search, pink baby towel. Then I want our pink baby towel to be the one that shows up in the results there, so that’s one thing that’s very good, to use keywords that describe your product. Same thing if it’s like a different size or a different style. Our gray one’s like an elephant, so we have elephant in there because some people search for elephant baby towel. To answer your question there’s a bunch of the keywords will be the same, but I also try to use whatever descriptions I can of that particular variation, because oftentimes people do search for that. No, I would not recommend … I don’t think there’s even freight forwarders on Alibaba, but I wouldn’t recommend them, okay? For finding a freight forwarder, you could use something, so some of the popular ones are like Flexport, so flexport.com. Shapiro is a pretty popular one, and both these companies are used to working with Amazon sellers and they’re used to importing things from China. You can simply just do a Google search for freight forwarder. There’s a service called Freightos, so it’s just like freight with OS on the end. Freightos is, you can kind of think of it as the KAYAK search engine or the [Orbits 00:24:28] or whatever, for freight forwarders. You enter your specifications and they get you a bunch of price quotes from different freight forwarders. That’s one way to go about it. You could probably get the best price if you go about it that way. Yeah, I would recommend doing that as opposed to using the freight forwarder that your factory recommends. Awesome, thank you for tuning in. We appreciate it. I always ship my goods straight to Amazon, but that’s because I don’t want to deal with this product, I don’t want to unload all these boxes, I don’t have anywhere to store them but maybe you have a garage or somewhere else you can store them. A lot of first timers do like to ship it to their house because quite honestly it’s just like, it’s fun, right? You just spent like a couple of thousand bucks to order 500 units of xyz widget, right? It’s like kind of fun to see those for the first time and get to hold them in your hand and know what you spent your money on. It also gives you chance to inspect for quality. That’s just fun for a lot of people. Then you put another good point on there that if you do have a place to store it, like a garage or something else, you can store it there and ship them to Amazon in smaller amounts to make sure, or lessen the chance you get hit with some larger storage fees. That’s really up to you. If you want to see your products and you have somewhere to store them, then go ahead and ship them to yourself. If you would prefer to save a little bit of money and you don’t want to deal with all the boxes then you can ship them straight into Amazon. Unfortunately there’s usually not a lot you can do about this, okay? US customs will randomly select items to do deeper, further inspections to. It’s unfortunate but there’s not a whole lot you can do about it. One tip I do have for you is for example if it’s a product that comes into contact with food or drink, it does need to be FDA approved, okay? You would want to make sure to get that before then because they’ll ask for that in the US customs, so that’s a little tip I have. Okay, so I definitely wouldn’t ditch your first product yet, okay? I would look at optimizing your PPC campaigns, because that’s what you said’s eating away your profit, or you could potentially try to turn those off altogether then see what your sales or profits are after doing that. That’s an option. Yeah, so I wouldn’t give up on your first product yet, because there’s always optimizations you can make to your products. You can split test using a tool like Splitly to check a different main image, or a different price, or something else. Yeah, I would recommend to optimize before … To do a little optimization before just giving up on that product. That being said you can always launch a second product as well, but I wouldn’t give up, especially if this is your first shipment, which I guess you said it was. This is from Anna on YouTube. The Niche Hunter, what we’ve done is we have gathered a whole bunch of keywords and we’ve taken each of those keywords, which are essentially niches or niches if you think about it. We’ve looked at roughly the top 10 products for that particular niche and we’ve gaged the overall demand, the overall competition, the overall opportunity and then we put it into the Niche Hunter, okay? That’s how it works. How you use it is you sort through the different keywords or the different niches to look to see if that’s the type of product that you’d be interested in selling or if you would be able to find a factory for that, okay? So yeah, the way you filter through the keywords or niches are by using the filters at the top, so you could say I only want a product that’s selling at least 200 units a month on average, and I want something that is not very competitive, and yeah, some of those types of things. Yes. Good packaging, unique branding is always good, and that might be something that can differentiate yourself, you know, like on the pictures that you’re using. At the end of the day it’s not going to be as high as impact I don’t think, as what actual product improvements will, but it’s definitely a good start. When I’m figuring out the price of a new … Excuse me, figuring out my profit margins of a new product, I use 5% as an estimate for all of my sales, about what my total pay per click costs are going to be, okay? Now that’s an important thing to understand because your pay per click costs on an individual sale, that’s purchased after clicking on one of your ads, is going to be more than 5%. That would be like the best ACoS ever. Keep in mind, for every one item that you sell using Amazon sponsored products, hopefully you sell a few more just organically, all right? How long do you continue PPC after launching? I continuously use PPC, as long as it’s profitable and I’m making money by bidding on those terms then I continue to do so. Corey Lopez on Facebook asked this. I don’t foresee private label going away anytime in the future. This is a fun thing to kind of think about, but by private labeling, what are we really doing? We are cutting out the middle man, which are these big, bloated, inefficient corporations, and we’re replacing them with very lean companies, or lean individuals like yourself or myself. Then we’re, how we’re getting the products from China and onto Amazon, okay? It’s kind of like this new age of branding, you know? It’s this new age of internet brands. I think what we’ll see over time is like this is kind of like the future of retail in the US, is like these internet brands that are primarily bought off price, and reviews, and some of the branding, and gone are the days of these very bloated, inefficient corporations that have built these 100-year-old brands. The prices are marked up a lot because of their inefficiencies and we’re not getting a lot of value anymore just from that brand. Yeah, that’s kind of a little bit of a different, could be a different topic, but yeah, there’s no end in sight. I’ll probably need a new job in 20 years anyway, but in the meantime we’ll just continue on with Jungle Scout. With each marketplace on the Jungle Scout estimator tool, the categories are in the native language, so maybe you’re just kind of like translating that for me since I don’t know Italian, or yeah, maybe we missed it, I don’t know. We’ll have to look at it, but the idea is to have all the categories in that particular marketplace to be listed there, which I think there are because I haven’t heard that from anyone else. My advice to you as far as marketplaces go is to sell in whatever marketplace seems the least intimidating or the easiest for you to sell in. If you live in Italy, then the Italian marketplace is probably going to seem the least intimidating, and that’s where I’d probably sell in. I honestly don’t know. It doesn’t seem to me like this is a very widespread problem. Maybe I’m just kind of not in the know or you know about some secret stuff that I don’t, but it doesn’t really seem like a major problem anymore to me. After they made that change I think a lot of people were kind of still doing it for a little while, but I think most people have really cleaned up their act, which I would definitely recommend. What has probably happened here is there’s really two things here. It’s a possibility that this is a counterfeit product, that it’s not really your brand, it’s just a very similar product that someone else is listing on your listing. Or option two is they purchased your product, maybe at a discount through a lightening sale or with a coupon or whatever else, and now they’re trying to sell this on your listing. You can try to send them a message and threaten them with cease and desist to get them taken down. At the end of the day it’s usually not that big of a deal, like you said, the price is higher than yours so the only time that’s really going to sell is if you run out of stock, which isn’t necessarily a bad thing, because they didn’t take a sale away from you, and they kind of like kept your BSR up a little. Most of these aren’t worth worrying about. Good question, because there’s benefits of both of these, right? If you have them on the same listing as two variations then they all share the same reviews, and the sales of both of those both go towards improving your overall rank, right? I would say in a relatively competitive niche I would prefer to have both of the variations on the same listing, all right? In a niche that’s not very competitive, I would prefer to take up more real estate because I know I can probably rank both of those without many reviews and without many sales. Yeah. Augusto, you need sales to get reviews, it’s as simple as that, okay? The two best ways to get sales on a brand new product are through aggressive PPC spend on Amazon’s platform, and through giving away coupons. Of course I use Jump Send to give away coupons, but if you know a different way you could of course do that as well. What you’ll find is just through these additional sales you’ll start to get reviews, all right? Good question. The storage fees on Amazon, if you’re going through all your inventory within, let’s say 60 days, are relatively negligible with the exception of the fourth quarter. To be honest with you, if you’re a brand new seller and you’re just trying to launch your first product I probably wouldn’t even figure in storage fees, just try to factor in that you want to sell through all your inventory within like two months. If you do that you’ll see storage fees, with the exception of fourth quarter, are fairly negligible. Since we’re just at the end of February right now, if you’re launching your first product you’ll be able to kind of figure all that out over the course of the next few months, and then you’ll be able to kind of calculate that better for Q4 when storage fees are higher. That would be my advice for you. From most of the split tests that I’ve seen, just changing the last value doesn’t have an incredible impact on the conversion rate. I think typically when people tell you that it’s because they haven’t really reached statistical significance, like on their test, or they just changed it and then they looked at the conversion rate the next few days and it was better, but that was probably just of chance. If you’re interested in testing it I would recommend checking out Splitly, an A/B testing tool for Amazon sellers. It lets you run true split tests to statistical significance, which is just a fancy word for saying that it’s mathematically true, all right? You can test it, but I personally would recommend just testing the larger price, as in $23 to $24, or $23 to $20, or your main image, those are going to be the highest impact ones. I would recommend trying to order three months worth of inventory for your initial order, all right? I would estimate what I was going to sell based off what my competitors, let’s say in the top 10 or top 20 spots were selling. Then estimate that of how many I was going to sell over the course of three months, all right? The reason I say that is it typically takes about one month … After you place an order, assuming this is from a factory in China, it takes one month for them to run your product approximately. Some factories are a little bit faster, most are a little bit slower. Approximately one month to run your product through their production line. If you’re shipping by ocean, it really takes another month. So that means two months from the day you place your order to the day it arrives in the States or wherever you live. So that means you only have one month to sell before you have to place another reorder, but at the same time you don’t want to order too many when it’s like you’re just launching a product, so I always recommend ordering three months worth of inventory. In the Jungle Scout web app, so it’s different than the Jungle Scout extension, the Jungle Scout web app which is a different product, let’s you filter by opportunity score for the Niche Hunter, okay? There’s like 10 million or 20 million or whatever niches in there, and it lets you filter by the opportunity score. Good question. You know like, when you’re reading the Facebook groups or whatever else, or Reddit or something, people just tell horror stories or it’s like the place to go that people voice their concerns or problems. I think as a result of that it seems like some of these things are very widespread problems, when in reality they’re not. I’ve over 100 SKUs on Amazon and I’ve never had a product that I feel like there’s Chinese companies that are sending a bunch of bad reviews my way. To be completely honest with you I think a lot of people take a lot of pride in the products that they launch, so when they get one bad review they’re like, “Oh, this was just from my competitor.” Or whatever else. In reality it’s like, “Well, it might have been a legit bad review too.” I wouldn’t stay away from any particular categories, and to be honest with you I don’t think there’s a widespread problem. You could try to do that if you wanted. To me this seems kind of like one of those hacky type things that isn’t really building a true system to generate you money, which is what a real business is. I mean you could try it, but I recommend just like, if I’m going to invest all that time and effort into starting something, I’d prefer to start what’s more of a real, legitimate business. Good question. I can tell by your question that you have quite a bit of research to do. As far as a good site to read about creating software, my favorite resource for someone trying to bootstrap, so like self-fund a software company, is called … it’s a podcast called Startups For the Rest of Us. It’s hosted by Rob Walling, the founder of Drip, which is an email software tool that he self-funded and started. Yeah, that’s a great resource for it. What you’re going to find is starting software is very expensive and that’s the reason that you always hear about software companies going out and raising like a million dollars of seed money to get started, because good developers, which is what it takes to create good software, make good money, and it’s very time consuming, right? You have to pay a few people a lot of money for many months to create this, and that’s the reason that most people need like a half a million bucks to get started, or a million bucks or whatever. Yeah, that’s a little tip for you. Jump Send has coupon deal sites or coupon communities for the US and the UK. We’ll be expanding to more later, but for now it’s for those two marketplaces. All right, we’ve time for about two more questions. This was a little bit of a gray area. Baby toys definitely need this certificate, baby bottles or something definitely need the certificate. The towels were a little bit of a gray area because it’s like this is a towel, if it’s marketed towards baby does that make it a baby towel? Because adults could use this towel too. It was a little bit of a gray area. Since we’re in the public spotlight with this product and we wanted to make sure to do everything by the book we did get that certificate. That being said, if we weren’t launching this as part of the case study, I don’t know for sure if I would’ve gotten it or not. I tried to do a bunch of research on this and there was no perfect answer, so what it will come down to is probably your risk tolerance, whether or not you want to do that. I will tell you that I’m pretty sure none of our competitors do have the CPSC … I think that’s what the acronym is … certificate, however we did chose to get it. Leanne this is typically because Amazon believes that their product is more relevant for a particular search term than what yours is. Maybe they had that keyword search term in their title, or they’re in a different subcategory that Amazon prefers over yours. That’s typically what it is. It might also have to do, if they have a better conversion rate or a lower price, those are all the things I would look at why a competitor is outranking you even though you have a better bestsellers rank. That is a wrap, guys. Before you leave I want to remind you about a few things. One, please smash that like or love button on Facebook, or YouTube, or wherever you’re tuning into. Hit the subscribe button on Facebook if you haven’t done so already. We are releasing new YouTube videos a couple of times every single week. If you missed my announcement at the beginning, we are hiring. Who wouldn’t want to work at Jungle Scout? Junglescout.com/jobs. You can see all of the open job positions that we have. There’s a whole bunch of them. If you would love to work with the best team on earth, then that’s how you can do so. We have a few days left for accepting applicants to our new podcast, Go Pitch Win. Shark tank style podcast where one of you guys are going to be pitching your product or business idea to myself and another judge. Between the two of us we’ll choose one out of 10 applicants to win a $10,000 gift for you to invest in your business, all right? Some other good news, some people are asking about how our Jungle Slumber sleeping bags were doing. We’ve sold over 100 of them and they’re doing pretty well. I will see you guys in about a month from now for our next AMA in the Genius Series where we’re talking about product launch. Thank you guys, it has been fun. I hope everybody has a great day. Take care. End Month 1. Commence Month 2! Marketing. The first month of the Genius Series has come to a close. We learned a whole lot about product research, and hopefully, some of you who were still on the fence about the process are taking those first, all-too-important steps to getting started selling your own private label products on Amazon. 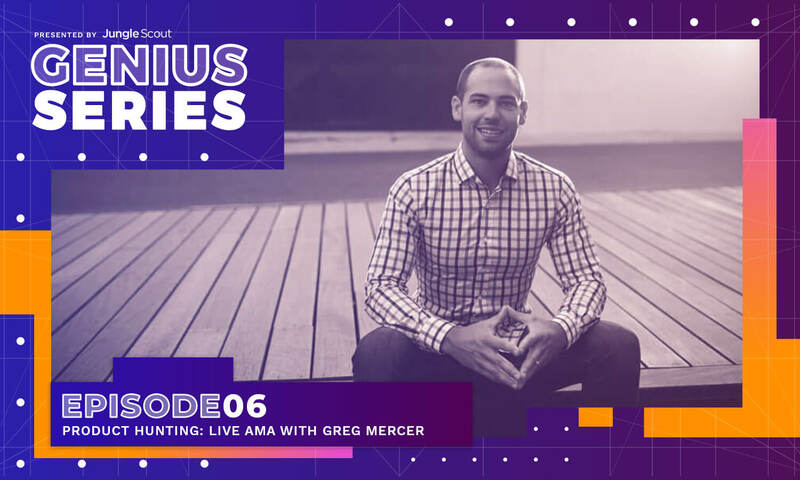 Next week, we’ll kick off the second month of the Genius Series when we dive into marketing covering old school methods as well as some of the new and improved ways of marketing your product on and off Amazon. 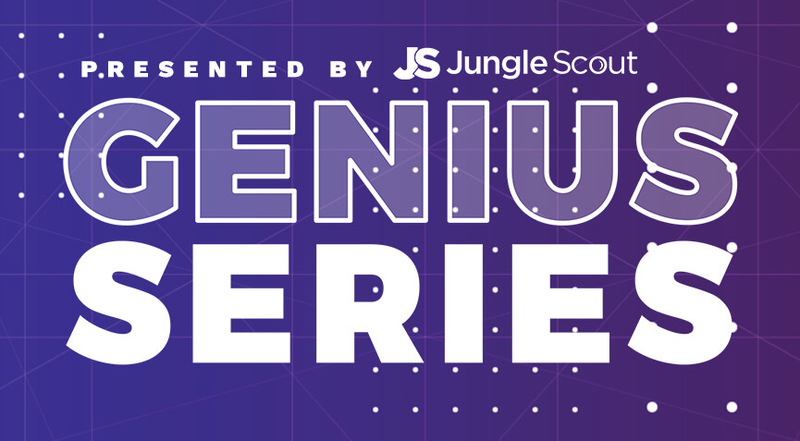 If you haven’t already, be sure to sign up for updates on the Genius Series. I always enjoy the information put out by Greg and his team. You are one of the few online professionals out there that we trust. I would like to know your input about the face of retail and how Millennials shop considering the high number of our young folks that are supposedly changing how the previous generations shopped. I read an article that while some of them shop online a large number still go into the brick and mortar stores and big brands are not really their “thing”, so to speak. I am really interested in your insight of how retail is evolving. Also, is Amazon in your opinion the better platform to sell, what about a combination of online and brick and mortar. In other words, would you consider selling your product online as well as having a brick and mortar store? Amazon does… You may honestly correct any misconceptions I may have here. Would love to hear your thoughts. Great questions! Greg rarely hits up the comments section (he wishes he could, trust me), but you would have an opportunity to ask him yourself when he does his next AMA the first week of April. Details will be in the Genius Series. But those are awesome questions, and I, too, would love to see his thoughts on it! Hi Greg. I enjoy listening to your podcast on how to start a business and selling on Amazon. I hear people say all the time how you can raise money on kickstarter or indiego (not sure if i spelled it right) to start your business. Can you do a webinar on how to go about it. Thanks a lot. Keep up the good work Lisa. Greg and I will be collaborating on a piece during the Genius Series that’ll go into detail on Kickstarter/IndieGoGo methods. Thanks for asking! Hi, I double checked the Free Sales Estimator Tool on the JS website and indeed there is no pet category for Italy (and neither for Spain). Interesting… I’ll let the devs know! Thanks Ignazio!